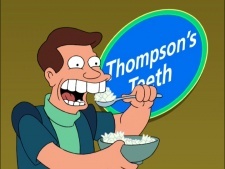 Futurama has a number of "sponsors" that are generally shown as a cold opening, before the title credits. They first appeared in season 2. Due to time constraints, sponsors were not featured in season 7. 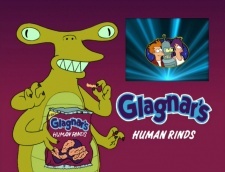 It's a buncha muncha cruncha human! 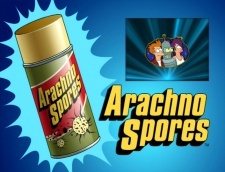 The fatal spore with the funny name! 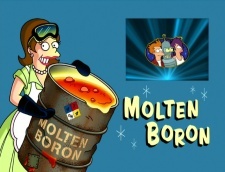 Nobody doesn't like Molten Boron! The singers hired to sing the tune used the incorrect "Nobody does it like Molten Boron". It was edited to take the "n" sound and put it after "does" to make the correct version. 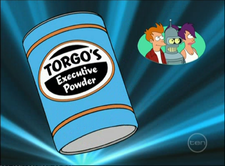 Only Torgo's packs the power of five highly paid television executives into every can for maxim odour absorption. Cash Cash Cash! 4 Your Bones! Too many bones?? Not enough cash?? Call Cash Bone! Ribs! Skulls! Spines! Even certain tiny ear bones! The leg bone's connected to the CASH BONE! Insuring your world, and its destruction. There was also a deleted sponsor, on the Volume Two DVDs, called "Soylent Chow" ("Because it's a dog-eat-dog world") with Frank Welker as Scooby-Doo saying "Rit's rearry rood!". Cash for bones may explain Amy's missing rib(s) in "Rebirth". Though her missing ribs may have just been a animation mistake. This page was last edited on 4 July 2017, at 06:21.